In the mid 19th century, there was a concerted and widespread effort to rename many of the counties in Michigan. A scholar named Henry Schoolcraft was enlisted for this purpose, and he proceeded to create a number of words, all of them faux Native American sounding, and assigned them to various counties. 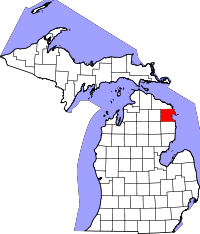 Alpena County is one such county with the name purported to mean something along the lines of "a good partridge country." The County's vital records are accessible through the Genealogy Department with the County Clerk on 720 West Chisholm Street, in Suite #2, in Alpena, MI. Birth records are available from 1869 to present day, and death, marriage, and other records from 1871 to the present. Due to space limitations, only two researchers are allowed at a time, and the office is open Monday through Friday, from 10:00AM until 4:00PM.